A friend of ours, Molly, posted on Facebook a picture of a snail that was hiding in the greens she'd just bought at Whole Foods. This reminded me of the time, a few years ago, I'd picked up some black trumpet mushrooms from the farmer's market. The mushrooms grow as tiny, flared tubes (like little black trumpets, natch? ), into which, over the course of their lives in the leaf fodder on the forest floor, fall all manner of arboreal dander. So, it's recommended that you bisect the tube, to brush out whatever has clogged it. And, in this case, what had clogged it, and fell out, scrambling, onto the kitchen counter, was something that looked like a tiny scorpion! It was only maybe 3mm long, and had no tail--a little tick-shaped lobster. Not especially threatening--but utterly freaky! I thought maybe I'd cleaved off its tail when I split the mushroom, but it looked uninjured and whole, relatively comfortable with its taillessness, if not with its sudden homelessness. I'm a little ashamed to admit that I... I think I brushed it into the sink and washed it down the drain... I must have been rushing to prepare dinner, is my excuse for... uh... not building it a little terrarium, yeah! I was happy to learn that this picture was taken by someone who, coincidentally, found it in a mushroom he or she was preparing for dinner--like, oh, okay, we've established that's where those things live, glad to know it! Brush your mushrooms! But what I especially enjoy about this photo is that it came from a forum for the North American Subaru Impreza Owners' Club (NASIOC). It sounds like an example pulled from a Clay Shirky book, extolling the new social bonds facilitated by the web--or maybe it only illustrates the weakness of those ties, as per Malcolm Gladwell--that someone cooking dinner finds a critter in their food and decides to share that news with whoever else on the continent drives the same car as the cook. I mean, obviously, it speaks to at least one great strength of the internet, that of crowd sourcing. There aren't a lot of folk around the house for me to ask about this bug (and I'm not liable to find much help if I cart it in a jar to the next Jaycee's meeting), but--welcome to the future, today!-- I can ask, pretty quickly, a broad cross section of... Subaru drivers. And it works: it only took ten minutes from the time this cook asked what that thing is, before a "Scooby Newbie" (which is, I guess, a recent purchaser of a Subaru--one who may, before long, graduate to "Scooby Specialist", or even "Scooby Guru") identified the bug as a pseudoscorpion. Who doesn't love Wikipedia (I mean, maybe, besides those who turn first to the NASIOC)? As someone with trouble isolating exactly what I'm interested in, I'm so delighted to have everything there, at any given time. I'm occasionally inspired to do small edits, here and there, mostly grammatical. I've given in to Jimmy Wales' pleas for donations. The project's virtues are extolled in a Clay Shirky book all its own. I frequently respond to queries at work, rhetorical or not, with, "That sounds like a question for Wikipedia". 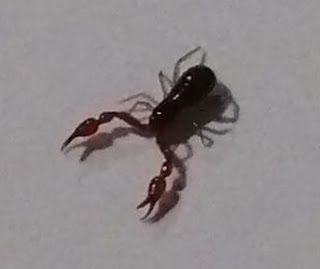 I'm not sure what's my favorite thing to have learned about the pseudoscorpion. Maybe it's that they're harmless to us, and even beneficial, by virtue of preying on smaller vermin? Or that they spin themselves little silk igloos when it gets cold? That "were first described by Aristotle, who probably found them among scrolls in a library where they would have been feeding on booklice"? I dunno. I also learned that they breathe like insects, through spiracles, little holes on their exoskeleton, and not like their closest relatives, the spiders breathe, with "book lungs". Who knew about book lungs? Turns out they're evolved from "book gills", like you might see on the bottom of a horseshoe crab! Yeah, I know you're bored. Anyway, while I was poring over all this, Deb was pulling up a video of the lifecycle of a pretty caterpillar we found along the road on Angel Island, a few weeks ago: a pipevine swallowtail, identified following the top result in a Google search for "northern California caterpillar". I'd somehow come to believe that caterpillars all wove themselves cocoons before becoming butterflies, but this video (and Wikipedia) reminds me that "(m)ost moth caterpillars spin a cocoon made of silk within which they metamorphose into the pupal stage. Most butterfly caterpillars, on the other hand, form an exposed pupa, also termed a chrysalis." Anyway... that's about it. I guess this is just another long-winded "Yay, internet! ", in the end. Bugs and all! One day, maybe, I'll stop being impressed by the firehose of information, and just accept it as the water we swim in. Xeni mentioned on BoingBoing, that Pandit Bhimsen Joshi passed away a couple days ago. He's a classical Indian vocalist. I'm fascinated by a lot of modern Indian culture (in my typically flighty, attention deficient fashion), and by the arc the nation is taking, internationally, economically, politically, this century. I've honeymooned there, and would love to go back plenty more. However, my familiarity and appreciation of Indian music is mostly relegated to the output of its various regional filmi industries. While I have a few Ravi Shankar albums, and have enjoyed some dance performances by Chitresh Das, my awareness of Indian vocal styles largely consists Asha, Lata, Kishore, and R.D. So, in the examples included in the memorial post for Pandit Joshi, it was educational for me to hear someone using his voice like Shankar uses his sitar, establishing the modality in the alap section of a raga. It was interesting, too, listening to some bhajans Pandit Joshi sings, in an extensive Youtube playlist that includes a lot of Panditji (along with Lata, and Shankar, and, oddly, videos from some Italian rock band), to hear him singing in unison with the tanpura, or harmonium, rather than in the call and response, which, it seems to me, is how the members of a classical Indian ensemble seem to go about establishing the modalities in their ragas. But, honestly: I'm writing at the outer reaches of my grasp of the art form. Deb said to me, "It sounds like--", and I completed her sentence, "Like Bieber 800% Slower?" She said, "No, like Trololo without Autotune". I feel like I run in circles that get all that, but it may just be Deb and me (at least here, in meat space). Bieber 800% Slower popped up, or rather blew up, on the interwebs, when someone apparently used some fancy free software to slow down a Justin Bieber hit to 1/8 of its original speed, without altering the pitch. The original song is called U Smile, and I'm not sure if I'd ever heard it before (I'll admit to being aware that there's an incredibly popular kid around, name of Bieber, and that there are a lot of lesbians with his haircut, but I don't know much more about him than that). At any rate, it's unrecognizable, in it's new form, which is full of cymbal washes and cathartic crescendoes of vocal drone. It's also some 35 minutes long. I can't find it on the web, anymore, but I put my own copy up, here. It's pretty beautiful, mellifluous stuff, suitable for meditating, in the same way you might so deem the Vilambit Khayal, above. I just think that's flat out hilarious. I can listen to either of those versions on an endless loop.